Home › Marriage minded Dating › In this New Year, what’s possible for you as a marriage minded single? Happy New Year! Exciting isn’t it? New Possibilities. New Opportunities. What do you want to make happen for you in 2017? In a recent webinar, I asked my community of marriage minded single singles to close their eyes and image what they want to see happen in the New Year? What are your top 3 goals for 2017? Because what I have witnessed as a life and relationship coach, and with my own personal experience, to really accomplish what we truly want to, you can only focus on 2 to 3 things in a 6 month to a year timeframe to truly succeed. So let’s say finding a marriage partner is one of your top goals. How do you want to make that happen for you? – What would you want to say to yourself that is supportive and encouraging? Next I would surround yourself with positive and encouraging people that will support your journey to find true love. And distance yourself from naysayers and negative influences. This is very important step to take. 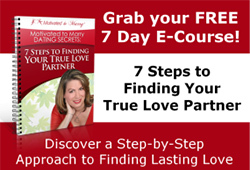 Last you need to find a program that will give you the tools and know how to connect with your soulmate and will help you take advantage of any opportunities that come your way, as well as, push you outside of your normal comfort zone. That is the exact formula I used when I was looking to meet my husband. And this is what is working for my clients for over a dozen years! The Motivated to Marry Dating Secrets program gives you everything you need to make better decisions for yourself around who you date and to recognize quickly the right person when you meet him or her based upon your critical relationship values and life goals. You become part of a supportive community of marriage minded singles who are all working towards the same goal. And you will get my personal support on the monthly questions and answer support calls. I’d love to talk about what you need right now to support your goals for 2017! Go to www.TalkwithCoachAmy.com and let’s me find out more about you and then we can set up a time for us to connect. I hope you are enjoying your New Years festivities with friends and family. I look forward to being there to support your life goals and dating efforts in 2017! PS. This is a critical time to get your 2017 goals on on the right track for meeting other marriage minded singles and eventually your mate this year! Go to www.talkwithcoachamy.com, sign up for a Meet Your Marriage Mate strategy session and Let’s see what’s it will take to make 2017 the year you find true and lasting love! ‹ 5 Positive New Years Eve Strategies for Singles!